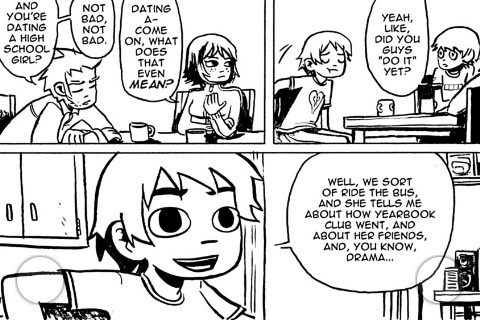 I’ve finally got round to reading the first (free) part from the new(ish) Scott Pilgrim app. The app is pre-loaded with part 1 of Volume 1. The reading method is the same as all Robot Comics on the iPhone. You read it sideways and press the translucent circles in each corner to navigate. The transitions are smooth and it takes advantage of the iphone’s vibrate for action panels! At the moment, only volume 1 & 2 are Â available for Â£3.49 each!